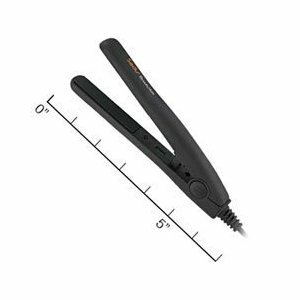 Sedu Revolution Shortie Mini Styler is a pocket-sized dual voltage tourmaline ionic straightener and curler. Sedu states it comes with all the luxuries and amenities of a full sized flat iron and is ideal for short hair, touch ups and travel. People who've bought the straighteners say it's great for short hair or quick touch ups when you're out. Sedu mini's are definitely small enough to fit in your handbag while on a night out. Although it says in the description it is a travel styler for short hair some customers didn't realize this, so ladies with long hair brought it only to find that it didn't work for them. Just a warning to those of you looking to buy these straightening irons, remember they are only designed for short hair and quick touch ups. Tourmaline Ionic plates with moisturizing ceramic heat. Convenient size at just 6 inches long. Travel Ready with built in dual voltage feature and bonus heat proof travel pouch. Touch up, straighten, curl, flip or finish shorter hair styles. The Sedu Revolution Shortie Mini Styler Iron retails for around $30 - $70. That's a big price gap so be sure to shop around for the cheapest price! You are currently browsing the archives for the Sedu category.